A couple weeks ago, I was doing some work at my computer during the dark wee hours of pre-dawn when I heard a ruckus among the chickens. I grabbed a flashlight and dashed outside. I should explain the poor chickens haven't had a chance to set foot outside in weeks because of the snow dump we've had this winter. 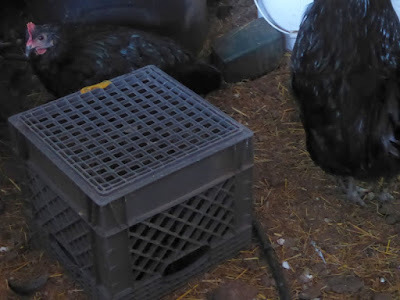 We have multiple roosters who would fight if confined together, so some birds have chosen to spend the winter in one of the stalls adjacent to the coop. Since they're reasonably protected, and since a coyote would have to go through two fences, the corral, into the barn, and past two cows to get to the chickens, I never gave the situation much thought. 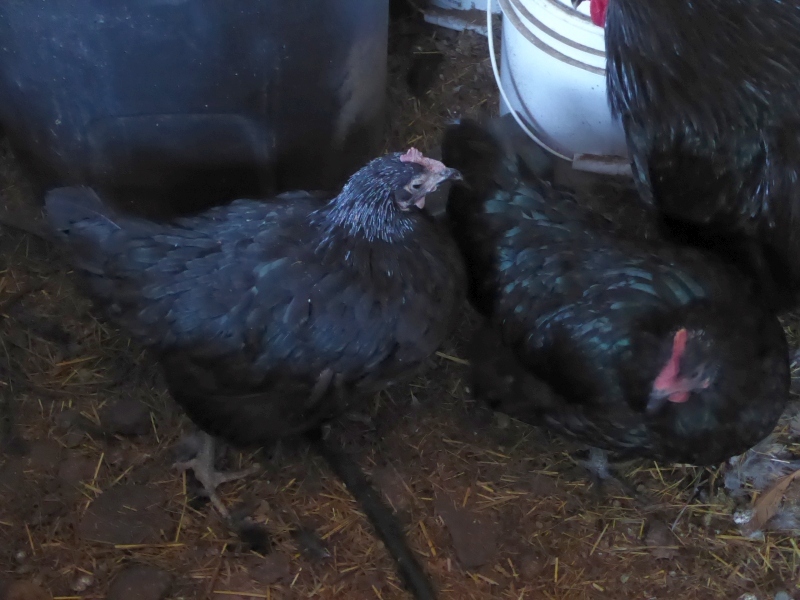 But several of the more wily hens preferred roosting in another less-protected part of the barn -- and it was among these hens that I heard the commotion. I made my way into the pen, fully expecting to catch a coyote in the act. Instead I saw -- a great horned owl. Additionally, this attack came about two weeks after a neighbor lost a goose -- a goose! 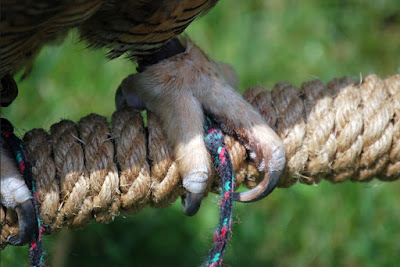 -- to a great horned owl. The neighbor literally caught the owl in the act of ripping open the goose's neck (he actually got a photo of the culprit; if he sends me a copy I'll post it here). Now, I'm an owl person. A serious owl-lover. I spent many years working as a field biologist surveying owls. I love 'em to pieces -- but NOT when they're killing our chickens, which this one assuredly was doing. The poor hen lying at its feet was flopping in her death throes. Seeing me, the owl took off, brushing past my ear as it made its way out of the barn. I picked up the hen. Her head lolled down, she was unconscious, and she wheezed and gurgled. I figured I'd put her in the washroom in the house to die in peace. I put a rag on top some laundry in a basket and bedded her down. Then I went back outside to search for any stray hens. 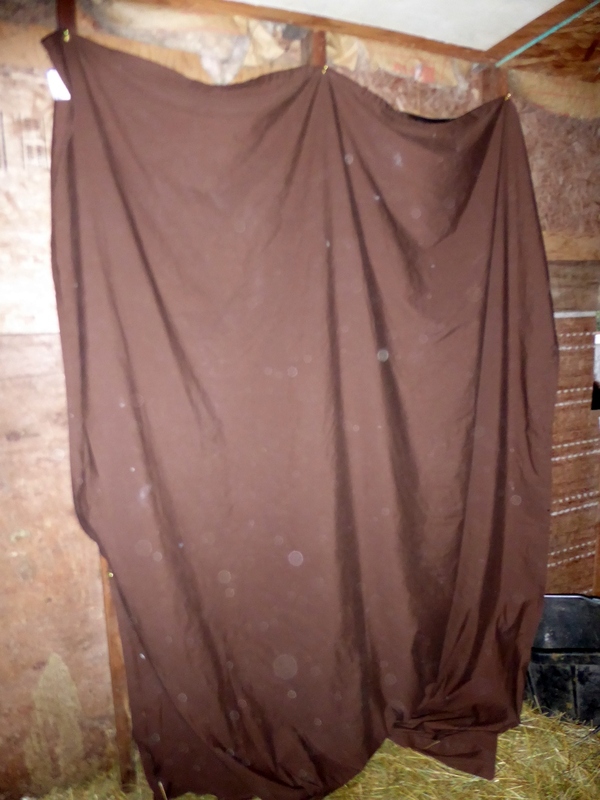 The owl was already back in the barn, but flew off when he saw me. I located a hen and put her inside the chicken coop, searched around for any others that I might have missed, and went back indoors. Half an hour later, I heard more telltale squawking. Repeat story: grabbed a flashlight, dashed outside, caught the owl in the act. Evidently I had missed a hen in the dark (black hens in a black barn are hard to see), and this lady was convulsing and dying at the owl's feet. "Get the [insert really really bad expletive I would never utter under normal conditions] out of here!" I shouted. The owl took off. The hen was doomed. I put a crate over her so she could die in peace, did a more thorough exam to see if I missed any more hens, and went back inside. 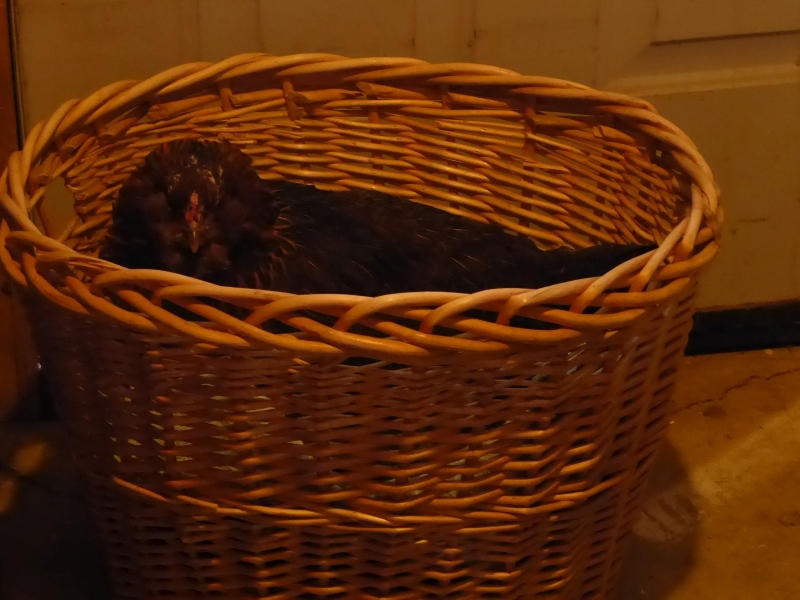 The hen looked over the top of the laundry basket at me. She was fine. Whoa. This lady was in such bad shape when I picked her up that I couldn't believe she'd made it. 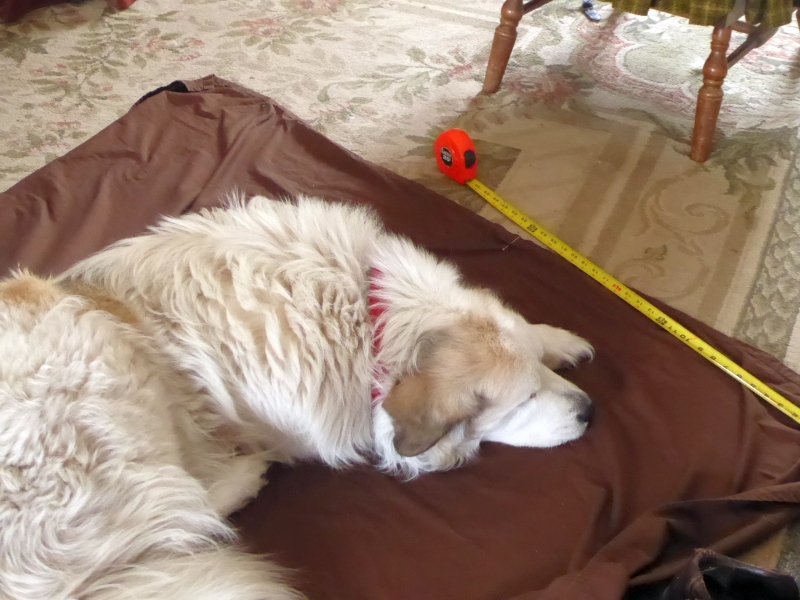 Relieved, I carried her outside and tucked her into one of the inner cages of the chicken coop with some young birds. Just in case she had any residual weakness or injury, I didn't want the older birds picking on her. ...so I took off the crate and saw -- a living bird. Whoa. Clearly we couldn't risk leaving the chickens unprotected in the open barn anymore. But nor could we tuck the competing roosters in the same coop without any means of escape (deep snow, remember). But in looking over the pen where the "alternate" flock has been spending the winter, I realized all we had to do was block the gate from letting owls fly through, and the chickens should be fine. So I sacrificed one of our bed sheets and attached grommets at one end to cover the gate. 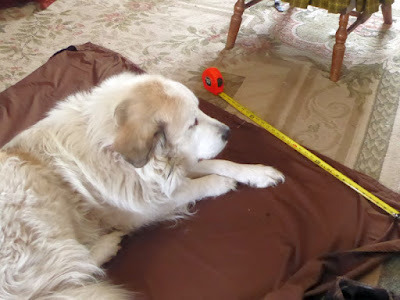 Here Lydia is offering some canine assistance as I measure. 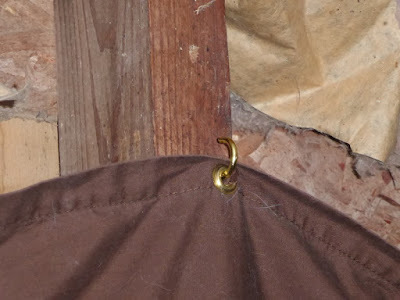 I hung the sheet from some hooks across the barn gate. The result looks tacky, but it seems to be doing the trick. No owls have disturbed the birds in the past two weeks. So now our new nightly routine is to pick up the one hen who persists in roosting each evening in the unprotected part of the barn, tucking her inside the pen, then hanging the sheet across the doorway. Once the snow eases up and we can get some outdoor work done, we will be completely reconfiguring the chicken coop to accommodate competing roosters. Meanwhile, needs must when the devil drives, as the old saying goes. I have several roosters that have been removed from our chicken "mansion" because of the same reason. They were supposed to be eaten but are too old now. 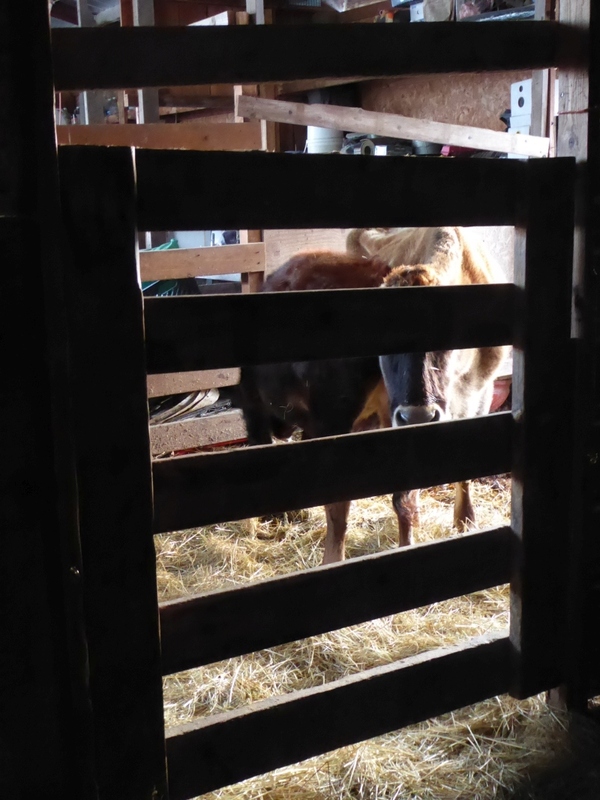 They bed on a wood pile in the barn but the poop is accumulating beyond desire and they poop on the patio rading the dog food bowl. I used to give them away on Craigslist but am afraid of them being used for fighting. Any ideas? If they're too old to eat, you might just want to shoot them mercifully and leave them where coyotes can clean them up. Hope this doesn't sound too cruel. If the meat is too tough to eat, can it in small jars for your dog to have as part of his meals, I know my dogs love chicken in any form. A french recipe for exactly this problem. Cook them all day in the crockpot on low, then chop and use them in chicken pot pie or chicken-n-dumplings. And use the remaining carcasses for making stock. That's what we've down with ours and they don't go to waste that way. Also, everyone here loves those dishes and no one has ever complained (or even noticed, I think) when I've used an old rooster for them. Tough meat can SURELY be tamed by a pressure cooker. As for the owl, you're a kinder soul than me! Mrs. Lewis, have y'all experienced any of the weather that is wreaking havoc in Wyoming? By the way that is a magnificent owl! No, our weather is actually moderating a bit. 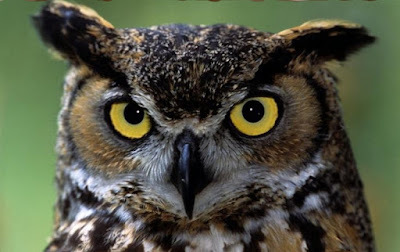 And I should make it clear, that's not my photo of the owl -- it's off the internet -- but great horned owls are indeed magnificent (except when killing our chickens, of course). 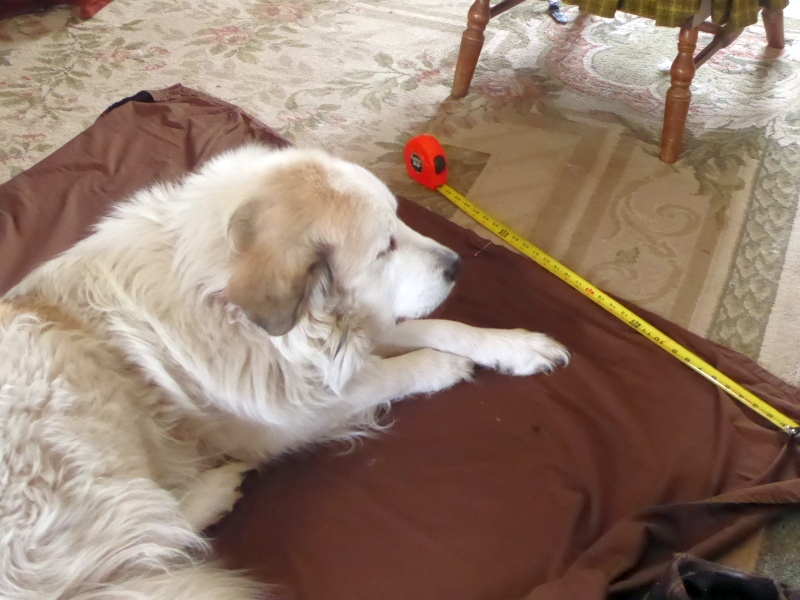 Two of the biggest challenges of Homesteading: Keeping critters in, and keeping critters out. A fox snagged one of our hens out of the barnyard but then dropped her in the field as he was trying to make his escape. The poor hen was huddled miserably in the corner. When I talked to her she would make a pitiful "wook" sound. She was limping and beat up and I thought she was a goner but every morning and evening I would nudge her over to the food and the water (chicken occupational therapy!) and pet her and talked to her. She pulled through! Sometimes they're tougher than we think. Glad your girls made it, Patrice. Blessings on this Lord's day. Speaking of girls, are the Bee Girls still humming? Last we checked, they were fine, but that was about a month ago so we're just keeping our fingers crossed. At this point they're either fine or they're dead, and since there's nothing we can do either way, we'll wait until the weather warms up to open the hive again. Now is the time to put protein patties in on top of the frames, I check mine about once every week, place my ear to the side and listen for the hum.